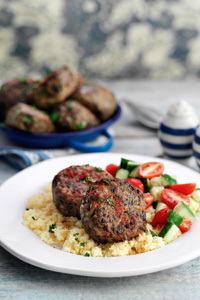 If you are trying to be good swap your mince burgers for this tasty veggie recipe from Slimming World. 1. In a food processor, blend 1 chopped onion, some fresh coriander, 400g canned green lentils (drained and rinsed), 1 tbsp mild curry powder and salt and pepper. 2. Add 110g grated carrot and 110g Quorn mince and mix well to combine. 3. Make into eight small burgers and brush with beaten egg on each side before frying in a pan sprayed with low calorie cooking spray. 4. Serve with cooked plain couscous and a salad of halved cherry tomatoes and chopped cucumber drizzled with fat-free vinaigrette. Follow with a Mullerlight yogurt, any fruit flavour.